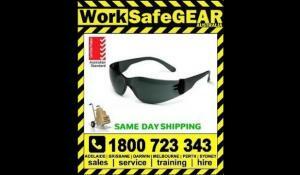 Order the Safety Glasses Burrup SMOKE Lens Eyewear Protection. Unbeatable prices on PPE and Height Safety products. Australian standard AS/NZS 1337.1:2010 (Personal eye protection - Eye and face protectors for occupational applications) for Medium Impact (the highest possible rating for safety eyewear in Australia). Certain styles of Pyramex (Australia) Safety Eyewear are also certified to the European Standard CE EN166 Personal eye-protection Specifications. EN166 is the core European standard to which all PPE involved in protecting the eyes or face must be approved. Within the standard, there are numerous levels of compliance, depending on the end use of the piece of equipment in question.